Coolio Nice to see you're back. Been a little busy lately with work. See if you can reach Adam to sort out the remaining specials. I'm just about done optimizing SODs, and will start writing proper AI. Not too much left to do, just finishing touches now. I joined about six months after I started following the progress of this mod. ~February of 2005 is when I discovered Future Tense. Every year there was another "big update" and another test and another progress update. Nine years later and still nothing but a lot of enticing screenshots. Always ~90% complete, but never any closer to being done. I thought after the 2010 "Final push to Future Tense release" that we'd see something playable at least within a year. 3 years ago when that "final push" post was made, FT was 80% complete. This is the Duke Nukem of RTS games. Vaporware: Announced to the general public; never actually released nor officially cancelled... sounds about right. 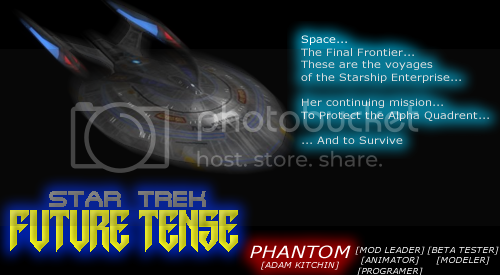 I made a person that now plays Star Trek Armada before this mod was completed. Perhaps he'll get to play STA:FT before he makes a little person of his own. The simple fact is, is that phantom has not been seen on afc for somewhere in the region of at least three years. He is also perfectly within his right to release whatever and however he wishes to. Best to just accept it and move on. Three years? Really? Time flies! Life has been a bit manic what with ill health and changes n stuff so modding along with a load of other stuff was shelved. I spoke to Taras (Mr Vulcan) earlier this evening to see what his circumstances are. Were looking at resurrecting the team to get Future Tense finished. Any new hands wanna get involved then get in touch with your specialist skills. From what we worked out briefly, we especially need special weapon coders, weapon texturers and someone to model map objects and units. however does this mod offer anything new besides new ships or stations?? Please guys we need an update!!! PLEASE!!! Since the last post here, Jan 24 2014, quite a lot was done to complete balancing (cost, strength, build times, special wep complements). We're quite happy on that front. - create wireframes for all units. We've had the wireframes on and off on our to-do list since 2007, really. We've both felt that wireframes (or thumbnail) implementation in Armada is a critical feature that we can't simply overlook, or fill with non-functional images. So, as it stands, we need to write a script for 3dsmax to help us in automating the wireframe making process. Making the wireframes by hand (screenshot/copy and cut method is hopeless here with close to 1500 unique wireframes/thumbnail sequences required). The good news is that the said script is somewhat functional and works well with a few test wireframe sequences. The challenge, however, is in preparing roughly 360 remaining models (3ds max files) to work properly with the script. Currently, the script renders a sequence of images and processes them as "layers" for the wireframes. We have two processing schemes for two difference races; Federation and Romulan GUI wireframe sets. We still need to think of and implement a processing scheme for Sernaix and Borg GUI. Everything I have listed (sound effects, script additions, wireframe processing, any bits of balancing left over) demands significant time to do properly. In the past, some things we could do by dedicating 30mins every day to modding; bit of model editing here, bit of weapon debugging there. Now however, the remaining tasks are really hard to complete in really short "modding sessions". Rest assured that we're trying to complete the mod, but we are both very human with all the associated ailments and shortcomings. Can we get a mid-year 2016 update? Well, no reply for last year's update request tells me that this is well and truly dead. Any chance of a release of the work-so-far, if anyone still has the files sitting around? After waiting half my life for this mod (I was 13 when I joined these forums, I'll be 26 this October) I'd love to get my hands on at least some part of it, for no other purpose than to check it out and play with it myself.